Your little Princess will fall instantly in true love with this sweet dressing table! 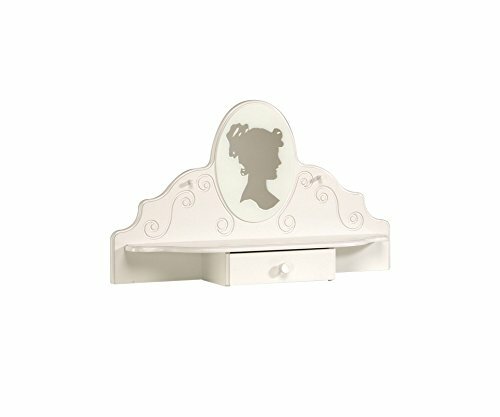 glossy white lacquer finish with scalloped edges and carved Ribbon embellishments, combine with an oval cameo-style silhouette in the center of the Vanity. It features a drawer and shelf to store and display all her favorite things in style! the dressing table is made from quality MDF boards with high density for durability, and is joined with heavy-duty steel hardware, and finished with lacquered veneer that resists water ring damage, stains, scratches, and fading or yellowing from UV rays. This Vanity fits neatly on top of the 3-Drawer chest or the desk, allowing you to create exactly the arrangement for your little sweetheart! Eclectic design: the neutral white color and scalloped edges create feminine appeal that is versatile for all color schemes, Bedroom themes, and grows with her through teen years! Feminine detail: swirling carved ribbons and oval cameo-style silhouette design are the girlish touches She will love in her own Bedroom! Organized storage: a shelf and drawer add storage and display area for her favorite treasures, makeup and jewelry! VERSATILE use: this piece is designed to Top the Alice collection 3 drawer dresser or the desk Styles! product: Apricot of France has received the Green Way Award for their commitment to wood-sourcing, manufacturing, and recycling practices. If you have any questions about this product by Parisot, contact us by completing and submitting the form below. If you are looking for a specif part number, please include it with your message. Guidecraft Classic Espresso Vanity & Stool is a lovely addition to her room & will make her feel grown-up -It has three-sided acrylic Mylar mirror, storage drawer & curved legs on vanity -Measures of vanity:28x13x42" stool:16x13x15". By Levels Of Discovery / NOT "noooshi"